No need to despair if you’re devoid of a natural craft gene – Suzanne Houghton reassures us even a complete beginner can crochet one of these little gems! A great gift for an older child who already has one of everything or is tricky to buy for, this little craft project will be sure to keep someone busy for a wee while. And with an end product as cute as the owl above, what is there not to love about the fine art of crochet!? While the owl is indeed cute, he’s only one part of an irresistible line up of Make It Yourself Crochet Collectable kits that include a bunny, puppy, piglet, chick and flowers. Each kit includes everything you need (see below) to create your chosen project, including a crochet hook, safety eyes and easy step by step instructions. 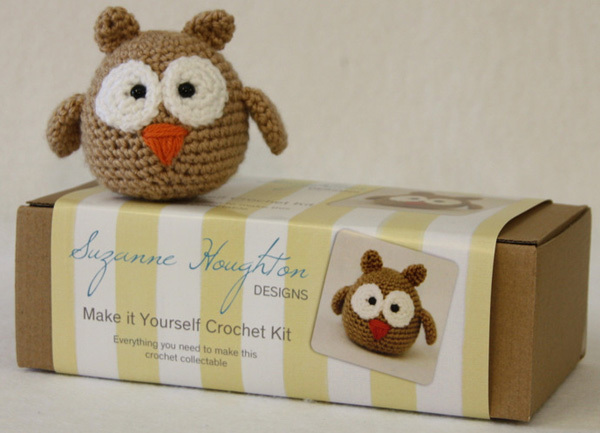 Make It Yourself Crochet Collectable kits are priced $32 (price inclusive of post anywhere in Australia) and available at Suzanne Houghton Designs.